Spaghetti Squash is my favorite pasta alternative. However, it takes a solid hour for it to bake in the oven, there is no such thing as quick spaghetti squash. Thanks to Trader Joe’s Cut Spaghetti Squash there is a world where you can prep Spaghetti Squash in under 10 minutes. It caught my eye when I was at TJ’s the other day and I had to give this game changer a try. 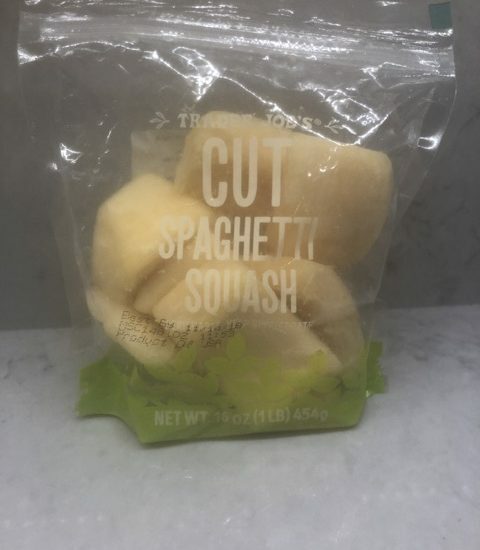 The bag suggests to pop the cut Spaghetti Squash pop it into the microwave for six minutes. However, you could also cook in a skillet or roast on its own. When you are trying to prep a quick and healthy meal after work, this is a true game changer. Spaghetti Squash can be used in so many creative ways. It has such a unique texture and it’s moldability the options are endless. Here are some of my favorite Spaghetti Squash recipes that instantly transform to quick spaghetti squash recipes thanks to Trader Joe’s Cut Spaghetti Squash. Now that you can make quick Spaghetti Squash, what recipes will you be turning too more often? However, if you don’t have access to Trader Joe’s, here’s my favorite way to cook a whole squash. Bonus Insights: Spaghetti Squash is great for those focused on a low carb, keto, or low-calorie diet as it only has 42 calories per cup, according to the USDA Nutrient Database. Because Spaghetti Squash contains ~92% water by weight it is a low-calorie food.